As already discussed in thread viewtopic.php?f=11&t=12691 and viewtopic.php?f=10&t=12734 I published "my" solution for VestaCP with MultiPHP and PHPBrew. The Solution is based on a little rewrite of the idea from Peter Anikin (http://anikin.pw/all/multiversionnost-p ... s-vestacp/). After that you have to rebuild the user with v-rebuild-user or inside of VestaCP Backend. Now you can use different PHP Versions for different Domains. 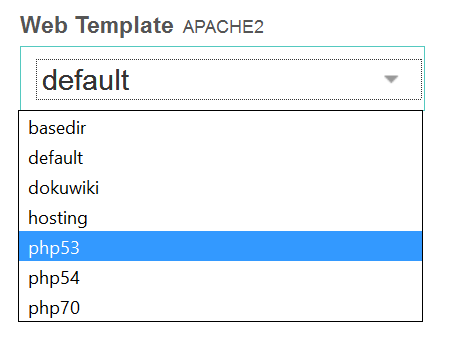 If you need to edit your php.ini file or include additional modules such as Ioncube you will find it under: /usr/local/php/php/php_x.x.x/etc/php.ini - after modification you don't need to restart Apache2, the change will be loaded directly with the next request over php cgi. MultiPHP is tested on Ubuntu Server 14.04 LTS, maybe someone can try this on Debian and let us know if it works. Edit 2016-09-27: Modified Installation Guide and added setup informations for PHP 5.5 and 5.6. I would suggest to switch base system to PHP 5.6, only 5.x version that is still supported (http://php.net/supported-versions.php) - then you can still switch to 5.4 or 5.3 if needed. Last edited by ScIT on Tue Sep 27, 2016 7:53 pm, edited 1 time in total. Script is not planed, compiling takes long and I think it's better to do this setup "step by step" for each server. If you have more then 4 or 5 VestaCP Server you can do a script by yourself. PHP 5.5 and 5.6 is not a problem, our systems runs with PHP 5.6 thats because it is not listed. I've updated the Documentation to add the requested PHP 5.5 and 5.6 versions. I would suggest to switch base system on PHP 5.6, only 5.x version that is supported (http://php.net/supported-versions.php). Then you can still switch to 5.4 or 5.3 if needed. Either rebuild the user with v-rebuild-user or inside of VestaCP Backend. Now you are able to use different PHP Versions for different Domains. MaryGutierrez wrote: Either rebuild the user with v-rebuild-user or inside of VestaCP Backend. Now you are able to use different PHP Versions for different Domains. Yep, like it's written in thread and guide :-). I'm glad that it works for you! If this does not resolv the problem, please post more information about your OS and VestaCP Version. The requested URL /cgi-bin/php/phpinfo.php was not found on this server. Do you have rebuilded your user? In VestaCP under User -> Rebuild or over command line v-rebuild-user username. If you follow the tutorial "step by step" it "have" to work :-).